With over 20 years experience in the beauty industry Sue Dewes, the owner of Tranquillo Beauty Clinic is passionate about her profession. She is especially devoted to helping her clients take their skin care and beauty Treatments to another level using the techniques and innovations she has adopted over many years of her career. 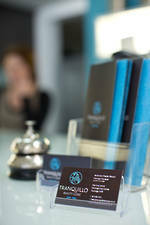 Tranquillo offers a complete range of beauty treatments. Sue and the team offer expertise and skills based on years of experience gained both in New Zealand and overseas. They stock high quality skin care products that are widely respected in the beauty industry. .
Sue Dewes arrived with her family in Tauranga from Dunedin in June 2011. Two days after she arrived she opened the doors on the new Tranquillo Beauty Clinic in Grey Street. She saw the need for a clinic of Tranquillos calibre as adding something extra special to the local marketplace. Since the doors opened she has not looked back. Sue has spent the past two decade building her knowledge and finely tuning her skills in the beauty industry. She has had two successful in Gore and Dunedin has has studied overseas in South Africa, America and Australia. She is well respected and has a reputation as an intelligent and accomplished Therapist.A number of industry awards and accolades reflect Sue's energy and passion for her profession which she says is "all about helping people be the best they can be". She has gathered together a team of like-minded expert Beauty Therapists to ensure her clinic offers a quality of service that is now a recognized asset to Tauranga and its inhabitants. Tranquillo Beauty Clinic prides itself on offering personalized, results-driven beauty therapy in a serene and relaxing environment. Our staff are passionate about delivering exceptional results. We are highly experienced and pride ourselves on building trust and rapport with our clients. Tranquillo Beauty Clinic uses skin care products of the highest quality, including Dermalogica, Environ, Sothys , Skincare RX, One truth 818, Jane Iredale. For unwanted hair removal, facial treatments, massages or nail treatments, Tranquillo Beauty Clinic has a comprehensive range of services to meet your needs. Click here to learn more about our team of expert beauty therapists.